If the most-recent performances we’ve seen from Alabama quarterback Tua Tagovailoa and Oklahoma’s Kyler Murray are any indication, the latter has a fighting chance to come away with this year’s Heisman Trophy. These two signal callers are seen as the favorites to land the nation’s top individual award. But last week’s championship games tell us a story of one quarterback playing at a much higher level right now. Murray — a first-round pick of MLB’s Oakland Athletics this year — put up 418 total yards and three touchdowns with zero interceptions in Oklahoma’s Big 12 Championship Game victory over Texas on Saturday. Meanwhile, Tagovailoa tossed one touchdown and two interceptions in Alabama’s victory over Georgia in the SEC Championship Game prior to exiting with an ankle injury. It took backup Jalen Hurts’ brilliant performance to lead the Crimson Tide back against the Bulldogs. This has led to Murray overtaking Tua as the betting favorite to win the Heisman Trophy in New York City this coming weekend. While recency bias favors Murray over his Alabama counterpart, it’s important to note that Tagovailoa is coming off one of the best statistical regular seasons in recent college football history. He put up 41 total touchdowns and two interceptions. That’s despite the fact that he barely played in the fourth quarter this season. For his part, Murray put up 51 total touchdowns and just seven interceptions. The comparison is real here, at least from a statistical standpoint. 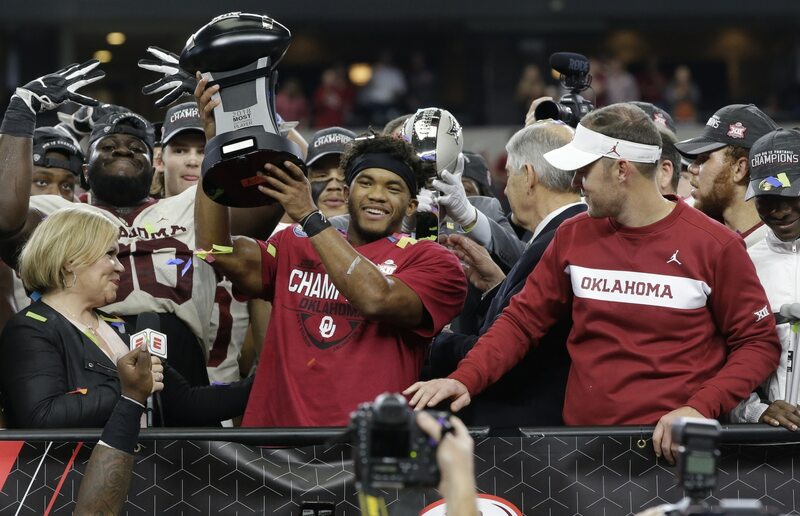 Even if Murray does win the Heisman Trophy, Tagovailoa can get his revenge in the Orange Bowl later this month after Oklahoma earned the final spot in the College Football Playoff.